In this exclusive audio interview Emmy Winner Charlotte Robinson host of OUTTAKE VOICES™ talks with entertainers Will and Anthony Nunziata about their upcoming Carnegie Hall debut with The New York Pops on December 16th and December 17th in NYC and new Christmas EP “The Gift Is You”. The new XMAS EP features holiday classics as well as three original songs including the title track “The Gift Is You.” The Carnegie Hall concert on December 16th and 17th entitled “Make the Season Bright” is led by New York Pops Music Director Steven Reineke with a quartet of guest stars including Broadway siblings Ann Hampton Callaway and Liz Callaway. In recent years the brothers have brought their distinct take on classic and contemporary songs to performing arts centers and theaters as well as symphony concerts with orchestras such as the Detroit Symphony, Cleveland Pops Symphony, Colorado Symphony, Lancaster Symphony, Annapolis Symphony, Cape Cod Symphony, Toledo Symphony and Edmonton Symphony Orchestra. 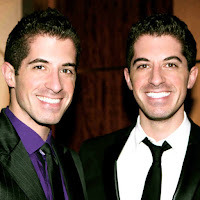 We talked to Will and Anthony about how performing at Carnegie Hall with the New York Pops this holiday season is a dream come true as well as a thrill to release their first Christmas EP and their spin on our LGBT issues. Charlotte, This is a terrific interview with Will & Anthony. They practice what they preach and they always lead with love. I'm thrilled to work with them and can't wait to see them at Carnegie Hall.